“This is the worst summer ever in New Zealand.” During our four days of prep in Wellington before heading off on our vessel, almost all my friends and colleagues I spoke to said this statement (often with added emphasis). It’s been cold and windy here all summer long, and when the weather has cleared it has brought only brief respite. These comments don’t bode well for our blue whale survey dependent on calm survey conditions, but February is typically the prime month for good weather in New Zealand so I’m holding out hope. And this unpredictable weather is the common denominator of all field work. Despite months (years?) of preparation, with minute attention to all sort of details (e.g., poop net handle length, bag size limits, length of deployment lines), one of the most important factors to success is something we have absolutely no control over: the weather. After just one day on the water, I can see that the oceanographic conditions this year are nothing like the hot-water El Niño conditions we experienced last summer. Surface water temperatures today ranged between 12.8 and 13.6 ⁰C. These temps are 10 degrees (Celsius) cooler than the 22 ⁰C water we often surveyed last summer. 10 degrees! Additionally, the current windy conditions have stirred up the upper portion of the ocean water column causing the productive mixed layer to be much deeper (therefore larger) than last year. While Kiwis may complain about the ‘terrible’ weather this summer, the resulting cold and productive oceanographic conditions are likely preferable for the whales. But where are the whales and can we find them with all this wind? 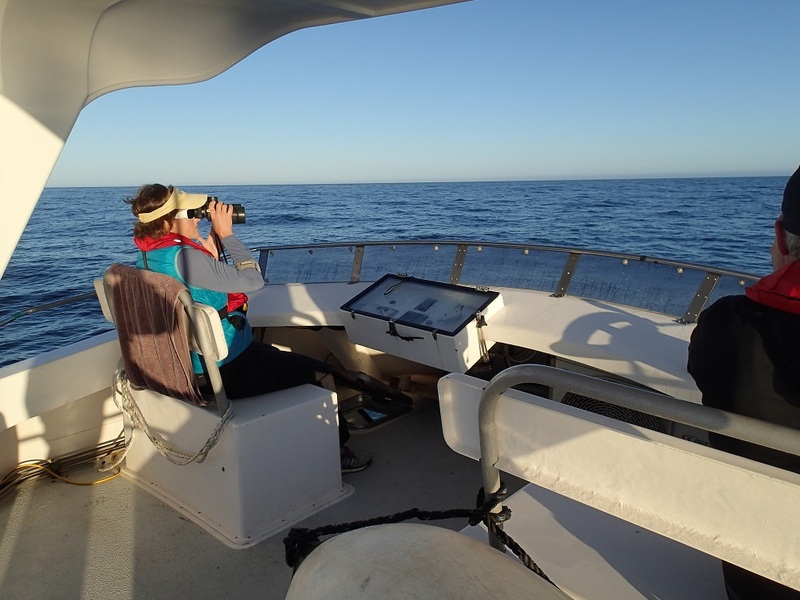 Today we had a pocket of calm conditions so our dedicated research team and crew hit it with enthusiasm, and collected a whole lot of great absence data. “Absence data?” you may ask. Absence data is all the information about where the whales are not, and is just as important as presence data (information about where the whales are) because it’s the comparison between the two sets of data (Presence vs Absence) that allows us to describe an animal’s “habitat use patterns”. 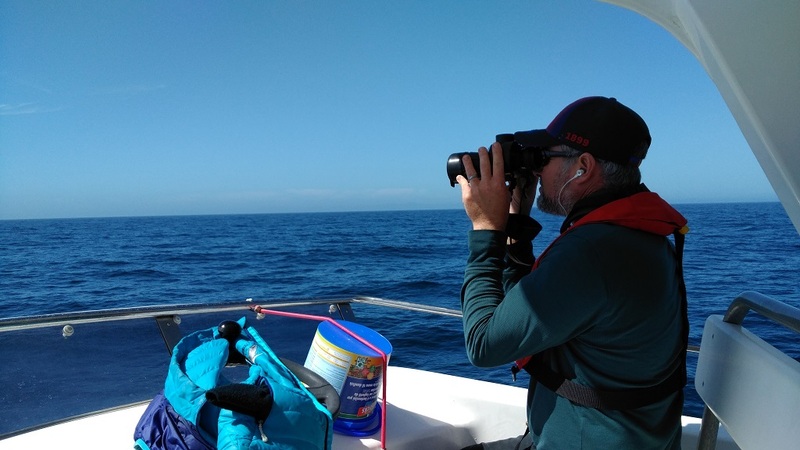 Today we surveyed a small portion of the South Taranaki Bight for blue whales for about 6 hours, but the only blue animals we saw were little blue penguins and a blue shark (plus fur seals, dolphins, albatrosses, shearwaters, gannets, prions, kahawai, and saury). But during this survey effort we collected a lot of synoptic environmental data to describe these habitats, including continuous depth and temperature data along our track, nine CTD water column profiles of temperature, salinity and florescence (productivity) from the surface to the seafloor, and continuous prey (zooplankton) availability data with our transducer (echosounder). So, now that we have absence data, we need presence data. But, the winds are howling again and are predicted to continue for the next few days. 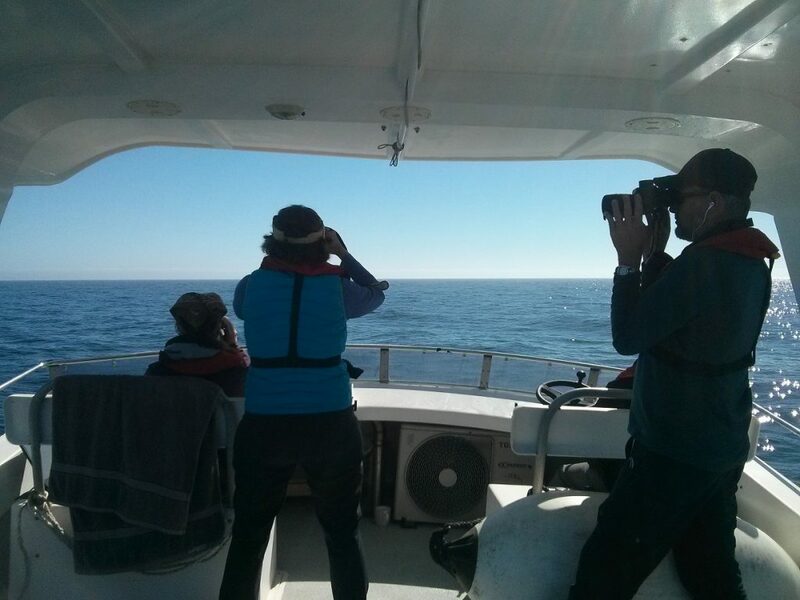 As we hunker down in a beautiful protected cove I know the blue whales continue to search this region for dense food patches, unencumbered by human-perceived obstacles of high wind and swell. So, while my Kiwi friends are right – this summer is not like previous years – I also know that it is the effects of these dynamic weather patterns that we have come so far, and worked so hard, to study. Even as my patience wears thin and my frustrations mount, I will continue to wait to pounce on the right weather window to collect our needed presence data (and more absence data too, I’m sure).